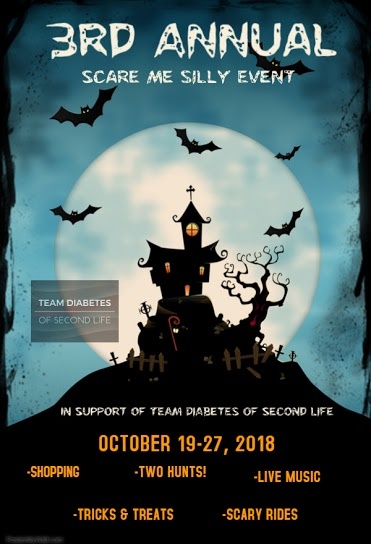 Scare Me Silly 2017, in support of the American Diabetes Association (ADA), opened its doors on Friday, October 19th, 2018, and will remain open through until October 27th. Organised by Team Diabetes of Second Life, the event features live performances. DJ parties, a hunt and a quest, tricks and treats, a haunted mansion, ghostly rides and – of course – shopping! oYo Breedables ,RP Roped Passions , Couture Chapeau , SK Kiva Studios Boutique, Xpllicit Designs , Firelight, Spyaralle, Team Diabetes of SL Merchandise Store, Park Place Home, Pixelancer, Esoterica Threads Clothing , Redangel Designs, LC Fashion, Closer to the Heart Creations , Fjordian Slip, BRYNE, Rush Love Your Look, Tayren’s Fantasy Fashions , Feyline Fashions , MMP Muircastle Motors & Parts, Stone Soup, De Baza, Twitchy’s Dragonsmeld, GypsyRose Botanical, The Chrone’s Garden, Mara’s Mysteries , TRS Designs , Just Ordinary, Bento Alive , Khargo Halloween, Cosmos Boutique, Lunar Seasonal Designs, Chiffon, Tylar’s Treasures, @AdReNaLiZeD@, Kushi Textures & Mesh, *DBS* Designs By Soosy, Littlefangs, POM, Kittycat’s Creations , Sweet E’s Designs, Image Essentials, Fae Fantasy Creations, Roosters n cHix, The Art of Talitha Alice, The Pumpkin Head, & Halloween Delights. This year the Evil Pumpkin Hunt offers a number of exclusive prizes available from a number of this year’s merchants. The prizes cost L$10, with 100% of proceeds going to Team Diabetes. Find on more about the prizes and merchants here. The Skele Hunt can be joined for L$250 (all proceeds to Team Diabetes). Use the HUD to find the pieces of skeleton scattered around the event space and claim a goodie bag of 15 prizes. The Kultivate Autumn Art Show will also be taking place during Scare Me Silly, with the art display located to one side of the event area. Participating artists include: Eleseren Brianna, Glasz DeCuir, Eucalyptus Carroll, Bellissa Dion, Ilrya Chardin, Veruca Tammas, Talligurl, Kapaan, Neoma Vasilia, Sheba Blitz, Hadiya Draper, Ladmilla Resident, Marcel Mosswood and IsarValdetaro Resident. As with the Scare Me Silly shopping event, all artists have at least one piece of art for sale with proceeds to Team Diabetes of Second Life. Scare Me Silly includes music and entertainment – check the schedule for details. Established in 1940, the American Diabetes Association is working to both prevent and cure diabetes in all it forms, and to help improve the lives of all those affected by diabetes. It does this by providing objective and credible information and resources about diabetes to communities, and funding research into ways and means of both managing and curing the illness. In addition, the Association gives voice to those denied their rights as a consequence of being affected by diabetes. Team Diabetes of Second Life is an official and authorised fund-raiser for the American Diabetes Association in Second Life. Established with the aim of raising funds in support of diabetes treatment and to raise awareness of the disease in SL, Team Diabetes of Second Life was founded by Jessi2009 Warrhol and John Brianna (Johannes1977 Resident), who serve on the Advisory Board along with Eleseren Brianna, Veruca Tammas, Rob Fenwitch, and Dawnbeam Dreamscape. The following notes are taken from the Content Creation User Group (CCUG) meeting, held on Thursday, October 11th, 2018 at 13:00 SLT. These meetings are chaired by Vir Linden, and agenda notes, meeting SLurl, etc, are usually available on the Content Creation User Group wiki page. EEP is now running on around a dozen Linden-controlled regions on Agni (the main grid). Expect the server-side code to creep to other RCs soon. Currently, running EEP on the simulator side can result in some strange skies when seen on non-EEP viewers (deep black skies, racing clouds, etc.). Rider and Graham Linden are working to improve this. Work is contining with fixing the Bake Service issues. however, as Anchor Linden, the lead for the project, is on vacation, this work will likely remain open until his return. Optimisations for dynamic bounding box computation on avatars and Animesh objects. Animesh attachments should now match the impostor state of the attached avatar. Animesh objects should no longer disappear when crossing region boundaries using the Mac viewer. The hope is this will be the final RC update to the viewer, and that it will, in due course be promoted to release status. One of the benefits of Animesh is that it should be more efficient, design-wise than the more usual alpha-flipping, potentially with a lower rendering cost. However, there are still questions around overall efficiency when it comes to general performance. A problem here is trying to do like-for-like comparisons; something the Lab hasn’t attempted to test. Rather, their focus has been to test whether the overhead of Animesh itself is going to be detrimental to overall performance. As such, creators who have been using alpha-flipping with animating meshes will need to test the potential benefits of switching to Animesh for their existing products for themselves. Animesh tri count limit: the debate over whether the 100K tri count per Animesh is “enough” rumbles on (although it often feels as if only one creator perennially believes it should be higher for in-world objects). In short, the total is unlikely to be revised up or down, although project ARCTan might affect it in the future. Mesh uploader: while no formal project has been announced, the Lab is hoping to take a look at the mesh uploader in the future with a view to improving it. So, if you’re a mesh creator and have some ideas on what might be done in this direction, now might be the time to raise your feature requests / bug reports. Are upload fees an encouragement for efficiency? possibly, but questionable, in the Lab’s view. Given that the upload cost is a one-time fee that could be made up after a few sales of the item / item the upload is used in (in the case of textures). Plus, those wanting to use high-res textures directly may complain over an increase in upload fees for larger textures, but would probably keep right on uploading rather than questioning whether or not they need such high-res images on every surface they are texturing.